This movie came on to Sky Premier last week and while movies of this genre never really float my boat, it was either this or another foreign language affair and this seemed a bit easier going. So the premise is as follows: serial dater Ally’s hits a wall in her life when she realises how all her friends are settling down with lovely men while she is still going out on meaningless one night stands. She then vows to make her 20th conquest the man she spends the rest of her life with, when this goes to pot, Ally is forced to try to rekindle the flame with her extensive list of ex-boyfriends. This all seems fair enough, but within the first 5 minutes of this story you will easily see what will happen in the end. What is the point of that? And that generally is my issue with romantic comedies, they are sickeningly predictable, save the occasional curveball such as (500) Days of Summer. Aside from the horrendous predictability, the film is quite amusing and entertaining. 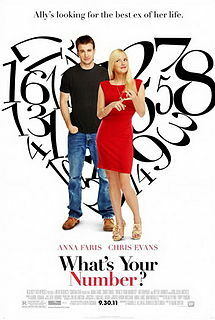 Chris Evans and Anna Faris are cute, gorgeous and sassy, everything you want really. The supporting cast is actually very decent: Martin Freeman, Ali Graynor, Joe McHale and Zachary Quinto all make appearances to keep you on your toes. Also, the soundtrack is fair. The problem is that films like this are forgettable and people take little from them, but who says films have to be memorable and life changing to be watched?